6 cottages ideal for family gatherings near the Spreewald. Property 20: 6 cottages ideal for family gatherings near the Spreewald. Property 23: Holiday home in the lake district - children welcome! Holiday house with a beautiful garden on the edge of the "Lower Oder Valley"
Property 24: Holiday house with a beautiful garden on the edge of the "Lower Oder Valley"
New holiday home in Brandenburg. 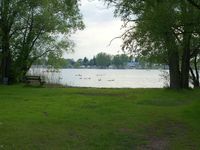 With own jetty and water access to the Havel. Property 36: New holiday home in Brandenburg. With own jetty and water access to the Havel. Fantastic stay and the host was very nice and accommodating!!! Had a very pleasant stay. The accommodations exceeded my expectations. The host was super nice and the location was perfect!!! Although our stay over the weekend was rather short, we enjoyed our time in a comfortable, well equipped holiday home. Just 3 kilomters up the road you get to the town of Burg with its small habor, caf&eacute;s, restaurant and other sights. Mr. and Mrs. H&auml;nelt, the owners of the holiday home, are very welcoming and have a lot of suggestions on activities around the area. This place is ideal for children with a huge lawn, a swing in the garden to use and the animals around, which were super friendly and the biggest attraction for our son.